Effect: You read someone's mind. Secret: On the top right corner of each right hand page of the middle third of a dictionary write the word printed at the top of the left page. Hold the spine of the book in your left hand and ruffle the pages with the right. Ask someone to stop you anywhere. Make certain he stops you somewhere in the central section. Open the book wide and ask him to remember the word at the top of the left hand page. You look at the word you wrote on the opposite page then pretend to read the spectator's mind. Magic is a wonderful hobby. 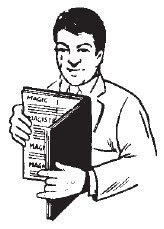 I have selected easy magic tricks, most of which can be performed with simple everyday objects. Have Fun! The magic tricks on this blog is for information purposes only. Our main purpose is to give entertainment hobby to our visitors, and make readers family & friends entertain and amaze through magic tricks. If we are infringing on anyone's copyright, please contact us by sending email. We will either remove the material or give credit to the deserving party. The privacy of our users is important to us. We do not collect any information on users and we do not resell or in any way distribute or share the names and or email addresses of people who subscribe to receive our easy magic tricks.